Home » Transition Year students experience "A Day in the life of Sligo University Hospital"
Transition Year students from a number of Sligo schools took part in the annual Sligo University Hospital's three day Transition Year programme. They received an overview of the many career opportunities available to them at Sligo University Hospital, including medicine, nursing, the national ambulance service, the laboratory and a variety of allied health professional roles. 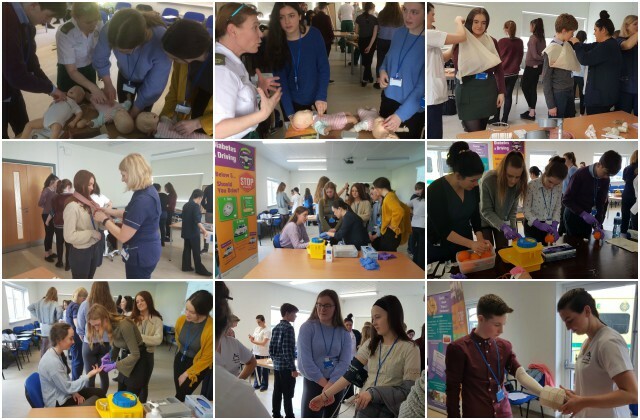 The programme was delivered by combining work shadowing and talks with practical applications including CPR, bandaging techniques, glucose testing and basic surgical techniques. Grainne McCann, General Manager, Sligo University Hospital said, “We were delighted once again to have been able to facilitate this programme for local students. The programme was developed a number of years ago by Sligo University Hospital to give students an opportunity to experience first hand the work that takes place at the Hospital. Our staff are very enthusiastic about this programme and are delighted to have the opportunity to show local young people the variety and breadth of their work to help students as they consider their own future career choices”.